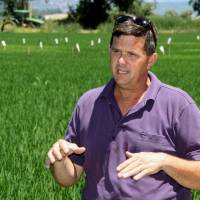 SACRAMENTO, CALIFORNIA - California rice farmer Charley Matthews Jr. remembers the excitement when Japan first started buying rice from the United States in 1993. “It really helped rice prices here,” Matthews, chairman of the California Rice Commission, said. It was also the beginning of a learning experience for California growers. Until then, marketing rice was not about quality, “it was about how many sacks you could grow,” he said. With 20 years of experience growing rice for Japan, California producers are hopeful the Trans-Pacific Partnership will open the market even more. Japanese negotiators are joining the latest round of TPP talks being held through July 25 in Malaysia. California farmers grow 70 to 80 percent of the medium grain and nearly all the short grain rice in the U.S. On average, half of the crop is shipped overseas. Half of those exports, around 300,000 metric tons a year, go to Japan under a World Trade Organization agreement implemented in 1995. But most of that has been under “minimum access” — a scheme that limits the use of imported rice, typically sending it to food and feed processors, government stockpiles or third countries as food aid. Japan also allows trading houses to facilitate some rice imports. Under this system in February, Japanese traders paid ¥108 per kilogram for U.S. medium grain but sold it for ¥273 with the Japanese government taking the profit. The same rice in the U.S. sells for ¥76 per kilogram. “We would like it to be easier for us to reach directly the final consumer, whether that is what we call the table rice market, the food service market or the industrial market,” USA Rice Federation Chief Operating Officer Bob Cummings said. How that rice would compete with the grain in Japan is an open question. Though short grain rice like Koshi Hikari is the favorite, the California rice industry has been working for years to cultivate a taste for the state’s medium grain, also known as Calrose. It would seem their efforts are paying off. Since early 2012, Japanese traders have imported more than 17,400 metric tons of U.S. medium grain, more than 175 times the total imported from the U.S. over the preceding decade. Medium grain makes up 90 percent of California’s rice acreage. Only 8 percent is traditional Japanese short grain. “Calrose is all I grow,” said farmer Don Bransford. The variety is hearty and high yielding and the plants stay standing until harvest. Though short grain varieties fetch a higher price, they yield as little as half of their medium grain cousins. They mature later and are taller and top-heavy so they fall down in the field and can get plastered to the ground by rain. The differences between the two varieties go straight to the heart of the differences in rice-growing culture between Japan and California. In California, there are around 2,500 producers on farms that average 165 hectares. In contrast, Japan’s nearly 1.2 million rice farmers typically cultivate 1.2 hectares, and on a part-time basis at that. California growers spread rice seed onto flooded fields by plane, while Japanese farmers typically insert sprouted rice seedlings with machines or by hand, a method that helps the plant stay standing. The high costs associated with California’s environmental and safety regulations mean farms have to be large and productive to turn a profit. This is in contrast to Japan, where small farms, heavy subsidies and little exportation have allowed rice breeders to focus on quality alone. “They’ve got the scientists, they’ve got the technology, but my opinion is that the national will is not to increase yields,” McKenzie said. One of McKenzie’s objectives is to marry short grain quality with medium grain quantity. In 2000, the facility bred short grain suited to California for the first time. Called Calhikari, the grain tastes similar to Koshi Hikari but yields more rice per acre. But getting more California rice on Japanese tables could be a long process. 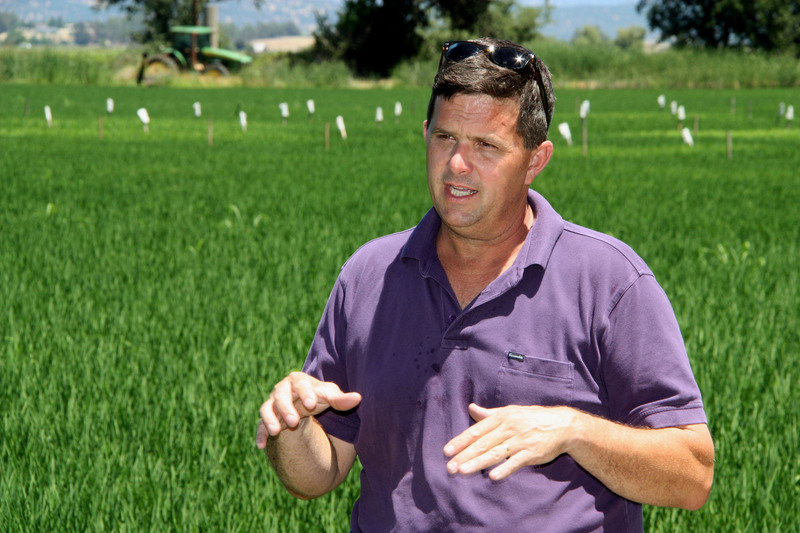 The California rice industry understands how sensitive rice is in Japan but there is still room for imports, Cummings said. While the Japanese market will need to adjust to imports, “it’s a stretch to say that rice production in Japan will go away because of TPP,” he said. U.S. rice growers are concerned that the exclusion of rice from the U.S.-South Korea free-trade pact set a bad precedent. Tim Johnson, chief executive officer of the California Rice Commission, said the industry has “no intention” of allowing a repeat and is lobbying the Obama administration and Congress. “We are patient,” said Matthews, citing a 10-year phase-in period that allowed Korean farmers to liberalize their industry when rice started to be imported under a WTO agreement.